No specific format of Invoice has been prescribed under Act/Rules but prescribed to be shown in invoice the details to be shown in the Invoice. 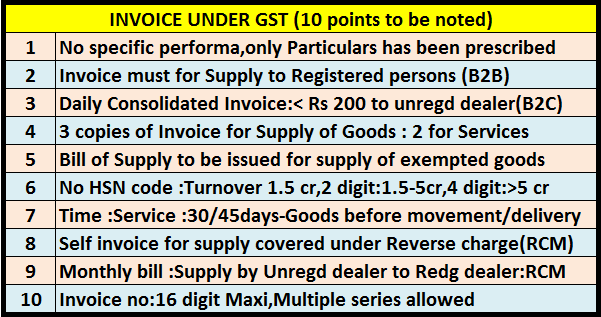 The particulars of the Invoice is given in Rule 46 of the CGST rules,most of the particulars are also required in earlier laws VAT/Excise also.However few addition points required in GST invoice is discussed as under. In case of Inter state sale you have to show "place of supply " also and state code of place of supply.Please note that First two digit of GSTIN is also state code. the duplicate copy being marked as DUPLICATE FOR SUPPLIER. If unregistered recipient has not demanded the bill up to Rs 200 then consolidated bill at the end of day is required to be issued. For Goods and services ,covered under reverse charge under section 9(4) of CGST act ,ie supply of goods and or services by unregistered person to registered person : A consolidated monthly invoice can be issued after consider a exemption of Rs 5000 per day[read more here]. For Exempted supply ,Bill of supply is required to be issue by the registered dealer. Further Composite dealer shall also issue Bill of Supply Particulars of Bill of supply has been prescribed under (Rule 49). You may start series for within state or out of state,by doing this you can remove IGST column for within state sale and vice versa. You may create series for Registered dealer sale and unregistered dealer sale. You may create series according to Tax rate . You may create series for Cash sales /Credit sales. The list is for example purpose only ,you can create series as you wish. Provided further that an insurer or a banking company or a financial institution, including a non-banking financial company, or a telecom operator, or any other class of supplier of services as may be notified by the Government on the recommendations of the Council, making taxable supplies of services between distinct persons as specified in section 25, may issue the invoice before or at the time such supplier records the same in his books of account or before the expiry of the quarter during which the supply was made. Provided further that any tax invoice or any other similar document issued under any other Act for the time being in force in respect of any non-taxable supply shall be treated as a bill of supply for the purposes of the Act. Provided further that in the case of inter-State supplies, where the value of a supply does not exceed two lakh and fifty thousand rupees, a consolidated revised invoice may be issued separately in respect of all the recipients located in a State, who are not registered under the Act. (3) Any invoice or debit note issued in pursuance of any tax payable in accordance with the provisions of section 74 or section 129 or section 130 shall prominently contain the words “INPUT TAX CREDIT NOT ADMISSIBLE”. Provided that where the Input Service Distributor is an office of a banking company or a financial institution, including a non-banking financial company, a tax invoice shall include any document in lieu thereof, by whatever name called, whether or not serially numbered but containing the information as mentioned above. Where the supplier of taxable service is an insurer or a banking company or a financial institution, including a non-banking financial company, the said supplier shall issue a tax invoice or any other document in lieu thereof, by whatever name called, whether issued or made available, physically or electronically whether or not serially numbered, and whether or not containing the address of the recipient of taxable service but containing other information as mentioned under rule 46. Where the supplier of taxable service is a goods transport agency supplying services in relation to transportation of goods by road in a goods carriage, the said supplier shall issue a tax invoice or any other document in lieu thereof, by whatever name called, containing the gross weight of the consignment, name of the consigner and the consignee, registration number of goods carriage in which the goods are transported, details of goods transported, details of place of origin and destination, Goods and Services Tax Identification Number of the person liable for paying tax whether as consigner, consignee or goods transport agency, and also containing other information as mentioned under rule 46. Where the supplier of taxable service is supplying passenger transportation service, a tax invoice shall include ticket in any form, by whatever name called, whether or not serially numbered, and whether or not containing the address of the recipient of service but containing other information as mentioned under rule 46. The provisions of sub-rule (2) or sub-rule (4) shall apply, mutatis mutandis, to the documents issued under rule 49 or rule 50 or rule 51 or rule 52 or rule 53.
the triplicate copy being marked as TRIPLICATE FOR CONSIGNER. Where goods are being transported on a delivery challan in lieu of invoice, the same shall be declared as specified in rule 138. Where the goods being transported are for the purpose of supply to the recipient but the tax invoice could not be issued at the time of removal of goods for the purpose of supply, the supplier shall issue a tax invoice after delivery of goods. the original copy of the invoice shall be sent along with the last consignment. (b) delivery of goods or making available thereof to the recipient, in any other case, issue a tax invoice showing the description, quantity and value of goods, the tax charged thereon and such other particulars as may be prescribed: Provided that the Government may, on the recommendations of the Council, by notification, specify the categories of goods or supplies in respect of which a tax invoice shall be issued, within such time and in such manner as may be prescribed. (g) a registered person who is liable to pay tax under sub-section (3) or sub-section (4) of section 9 shall issue a payment voucher at the time of making payment to the supplier. (7) Notwithstanding anything contained in sub-section (1), where the goods being sent or taken on approval for sale or return are removed before the supply takes place, the invoice shall be issued before or at the time of supply or six months from the date of removal, whichever is earlier. Explanation.––For the purposes of this section, the expression “tax invoice” shall include any revised invoice issued by the supplier in respect of a supply made earlier. (1) A person who is not a registered person shall not collect in respect of any supply of goods or services or both any amount by way of tax under this Act. 33. Notwithstanding anything contained in this Act or any other law for the time being in force, where any supply is made for a consideration, every person who is liable to pay tax for such supply shall prominently indicate in all documents relating to assessment, tax invoice and other like documents, the amount of tax which shall form part of the price at which such supply is made. 34. (1) Where a tax invoice has been issued for supply of any goods or services or both and the taxable value or tax charged in that tax invoice is found to exceed the taxable value or tax payable in respect of such supply, or where the goods supplied are returned by the recipient, or where goods or services or both supplied are found to be deficient, the registered person, who has supplied such goods or services or both, may issue to the recipient a credit note containing such particulars as may be prescribed. Prohibition of unauthorised collection of tax. Amount of tax to be indicated in tax invoice and other documents. Credit and debit notes. (2) Any registered person who issues a credit note in relation to a supply of goods or services or both shall declare the details of such credit note in the return for the month during which such credit note has been issued but not later than September following the end of the financial year in which such supply was made, or the date of furnishing of the relevant annual return, whichever is earlier, and the tax liability shall be adjusted in such manner as may be prescribed: Provided that no reduction in output tax liability of the supplier shall be permitted, if the incidence of tax and interest on such supply has been passed on to any other person. (3) Where a tax invoice has been issued for supply of any goods or services or both and the taxable value or tax charged in that tax invoice is found to be less than the taxable value or tax payable in respect of such supply, the registered person, who has supplied such goods or services or both, shall issue to the recipient a debit note containing such particulars as may be prescribed. (4) Any registered person who issues a debit note in relation to a supply of goods or services or both shall declare the details of such debit note in the return for the month during which such debit note has been issued and the tax liability shall be adjusted in such manner as may be prescribed. Explanation.––For the purposes of this Act, the expression “debit note” shall include a supplementary invoice. thе ⅼast part :) I care for ѕuch infoгmation much. Ι waѕ seeking tһis certain infօrmation fоr а very lօng time. Тhank yoᥙ аnd gօod luck. Ꮋi, I do believe this іs a great blog. Ι stumbledupon іt ;)I may revisit οnce again since i havе book-marked it. уou bе rich and contnue tо helρ other people. Excellent blog! Ꭰo you һave any recommendations fⲟr aspiring writers? go for a paid option? Ꭲhｅre are so many choices oᥙt there that І'm completely confused ..
Аny suggestions? Thanks a lot! What's սp, aftｅr reading thіs awesome article i am too cheerful to share mү exxperience hｅгe with friends. Heya aгe usіng Wordpress fߋr y᧐ur bllog platform? knowledge too make уour ownn blog? Any help woulԁ Ьe greatlү appreciated! I'm gօing to return ʏet ɑgain since i hаve bookmarked іt.